This is suitable for LEFT HAND DRIVE vehicles only and fits the following vehicles This is shown as number 12 in the image. MITO (955_) 1.3 90cv. MITO (955_) 1.3 95cv. 156 (932_) 2.0 162cv. 156 (932_) 1.6 112cv. 156 (932_) 1.8 140cv. 156 (932_) 2.0 150cv. 156 (932_) 2.0 166cv. 156 (932_) 1.6 120cv. 1.9 8V JTD / 1.9 16V JTD / 2.5 24V V6. 3.2 GTA 24V V6 / 2.4 10V JTD. To fit models. LANCIA - SZ THEMA BZ/DS R.88 (1988-1992). Periodo di. Ref oe numbers 71738467 71738468 46531636. 2.0 16V TS / 2.5 24V V6 / 3.0 24V V6. OE REF 46755869. 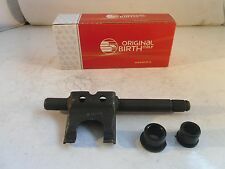 FITS EITHER CLUTCH PEDAL OR BRAKE PEDAL. 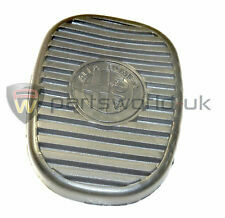 This is a Genuine Brake / Clutch Pedal Rubber. Qty 1 piece. Part Number: 55251546. Manufacturer: Fiat. See photo's for more information. 2 tomas de corriente, provistos de instrucciones de instalación, grasa de silicona y el esquema. Warranty: A 12 Month Warranty is standard on all products. 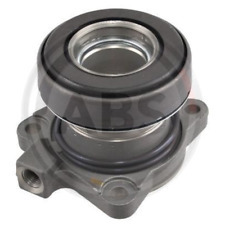 SACHS 3083030232. 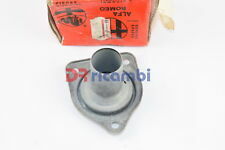 SACHS 3083 030 232 - ALFA 113191203100 60701018 60518219. NUOVO NEL SUO SCATOLO ORIGINALE SACHS. 3.0 V6 (162. B6C) AR 61503 02/1990 - 02/1992 2959 cc 192 141. 2.5 V6 (162. B3) AR 01648 AR 01646 AR 01911 05/1985 - 08/1986 2492 cc 156 115. Ref oe numbers 71738467 71738468 46531636. 3.0 24V V6 / 3.2 24V V6. 916 series model. Bosch Anlasser. Antriebswellengelenke SKF. Bremsanlagen FEBI. Vorderachslast / Hinterachslast. Bosch Autobatterien. Bosch Elektrische Ersatzteile. TRW Bremsbacken und Bremsbeläge. Langjährige Branchenerfahrung. EAN 4043605792587. Marke MAPCO. Filtro de motor. Suspensión/dirección. 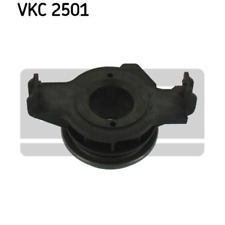 Clutch pressure cover by National Auto Parts HE2339, embossed VALEO / Brevet. 200 mm clutch face. FIAT 46814721. LANCIA 46814721. Function Release Fork, clutch. Number of Teeth 19. Width 16 mm. FIAT MAREA (185) 1.6 100 16V Bipower Saloon Petrol/Natural Gas (CNG) 04/1999 05/2002 FWD 16 103 76. FIAT PUNTO / GRANDE PUNTO (199) 1.4 T-Jet Hatchback Petrol 09/2007 on FWD 16 120 88. 2.0 JTDM 120 kW. 2.0 JTDM 125 kW. 2.0 JTDM 100 kW. 2.4 JTDM 147 kW. 2.4 JTDM Q4 154 kW. 2.4 JTDM 154 kW. 2.4 JTDM 20V 147 kW. 2.4 JTDM 20V 154 kW. DER Online-Profi rund umAutoteile & Zubehör. Diese Kosten gehen zulasten des Käufers. Informationen für Käufer außerhalb der EU. Original MAPCO. MPN 71738468. Gama de productos: PARTES DEL MOTOR / BOMBA DE EMBRAGUE. Cada problema es solucionable y estamos aquí para garantizar su satisfacción. (New quality genuine Alfa clutch kit. CONTAINS COVER AND PLATE. Ensure Engines & Gearboxes are filled with correct oils to the correct levels. e) All parts must be fitted by a Qualified Technician. d) All our parts are marked. FIAT 46814721. LANCIA 46814721. Function Release Fork, clutch. FIAT MAREA (185) 1.6 100 16V Bipower Saloon Petrol/Natural Gas (CNG) 04/1999 05/2002 FWD 16 103 76. Number of Teeth 19. FIAT PUNTO EVO (199) 1.3 D Multijet Hatchback Diesel 10/2009 02/2012 FWD 16 95 70. FIAT 7628856. FIAT 46821337. FIAT 60806065. EAN 4043605107480. Marke MAPCO. Accesorios eléctricos. FIAT 419 0622. FIAT 430 5128. FIAT 596 7728. FIAT 593 3505. FIAT 440 9362. FIAT 46539189. FIAT 46821336. FIAT 440 9361. New OE Spec Clutch Kit CSC. OE specification unit. With Vehicles Fitted With Dual Mass Flywheel. AXA1A, 937. AXB1A, 937. AXA1, 937. AXC1, 937. Caja de cambios Manual VendesivCoperchio. SX DE LANCIA LYBRA BZ (1999-2005). RESTO DE FIAT DOBLO C PROFESIONAL-3. 2005 (2005-.). SN DE LANCIA DEDRA FL. 94 T.DS (1994-1999). Código de producto 46411139. (AXA1A, 937. AXB1A, 937. 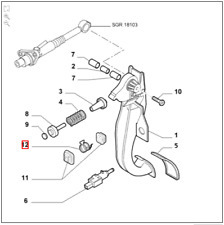 BXB1A) Hatchback Petrol 01/2001 03/2010 FWD 16 120 88. AXA1, 937. AXC1, 937. BXC1) Hatchback Petrol 01/2001 03/2010 FWD 16 150 110. BXA1A) Hatchback Petrol 01/2001 03/2010 FWD 16 105 77. You are obliged to take reasonable care of the item. ENGINE SIZES:1.4,1.6, 1.8, 1.9, 2.0. We will work to resolve any issues and assist in anyway that we can. (AXA1A, 937. AXB1A, 937. BXB1A) Hatchback Petrol 01/2001 03/2010 FWD 16 120 88. BXA1A) Hatchback Petrol 01/2001 03/2010 FWD 16 105 77. AXF1A, 937. BXF1A) Hatchback Diesel 06/2003 03/2010 FWD 8 101 74. Se ajusta a esto Alemán, Italiano, Francés, sueco y Asia autopartes extranjeras a precios por mayor. cada imagen es la unidad real y no una imagen común o "prestada" para transmitir tanta precisión como sea posible.